As a member of Brightlight Theatre you have unrestricted access to requesting tickets. Christmas, 1936. Connecticut, USA. Broadway star William Gilette, famous across the world for his portrayal of Sherlock Holmes, is preparing for a weekend of celebrations. But when one of his guests is found stabbed to death, Gillete himself assumes the role of Sherlock Holmes and attempts to track down the killer before they strike again. The danger and hilarity are non-stop in this glittering comedy whodunit set during the Christmas holidays. Saturday 8th December at 7:30pm and again on Saturday 15th September at both 2:00pm and 7:30pm at St. Peter's Church Hall, Frimley, GU16 7AQ. 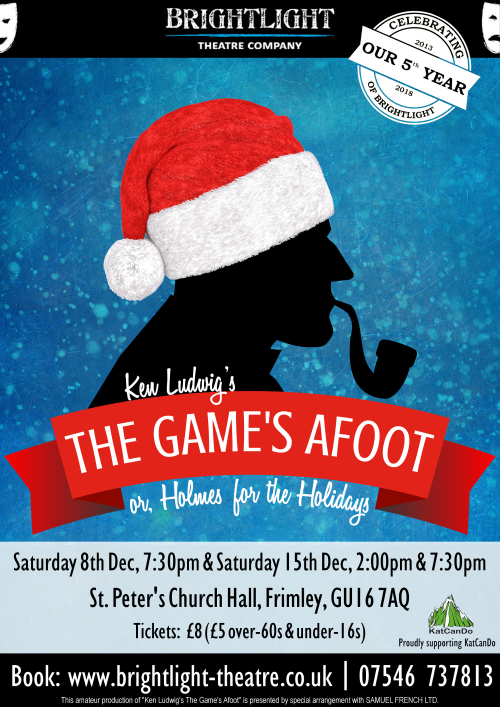 This amateur production of “Ken Ludwig's The Game's Afoot” is presented by special arrangement with Samuel French Ltd.
Brightlight Theatre Company is Frimley’s very own community theatre group. Our emphasis is primarily on having fun whilst providing high quality theatre for our audiences. We perform three main shows a year in addition to smaller studio productions. We've also enjoyed success in local Festivals winning awards at Woking Drama Festival for the last three years. A percentage of all our ticket sales are donated to KatCanDo in support of the amazing work they do to support local cancer patients.